The Big Four Arts Festival is a FREE event featuring 200+ juried artists, international cuisine, children’s activities, and entertainment. Each year, the Big Four® Arts Festival invites guests to join us on the first weekend in September under the Big Four® Bridge to enjoy exceptional art from renowned local, national and international artists. Nestled in the shaded tree lined aisles of the festival you will find nearly 200 artists including many brand new, never-before-seen emerging artists sponsored and featured by the Big Four Arts Festival. 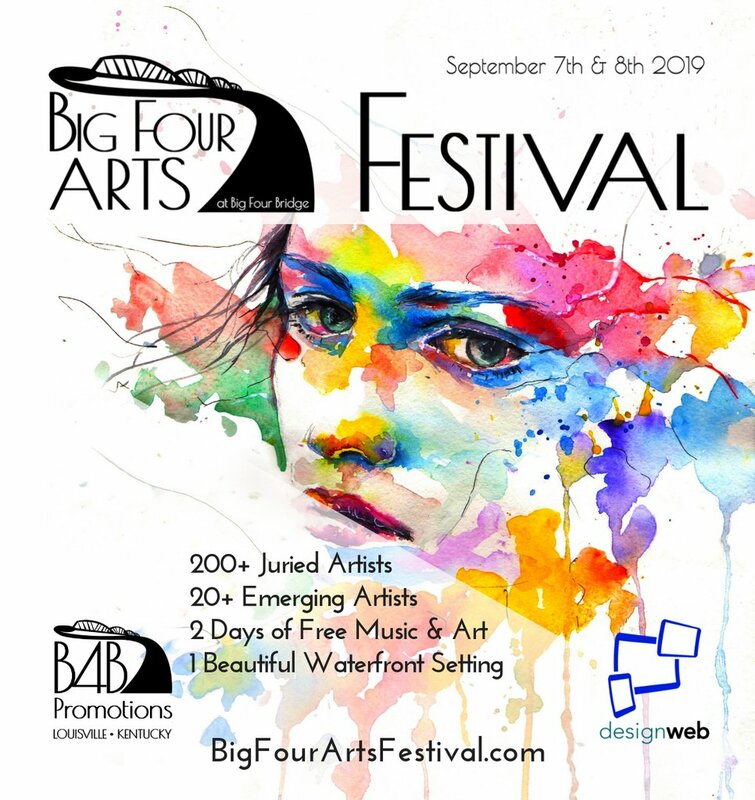 The Big Four® Arts Festival located just under the Big Four® Bridge is free and open to the public on Saturday and Sunday Thanks to the support of B4B Productions and Design Web Louisville. Each year, the Big Four® Arts Festival invites guests to also attend the Awards and Silent Auction Party Saturday evening at 7:30 pm just after the Festival closes. Awards are presented to our 2018 artists, and guests for this one night only event can view the art of our award-winning artists, enjoy delicious food and beverages and, of course, get the opportunity to acquire works of art through the silent auction! Proceeds from the silent auction benefit the Festival’s Emerging Artist Program and support the greater Louisville arts community. This is one of the most highly anticipated nights in Louisville’s social calendar. The Big Four® Bridge Arts Festival is a free public arts festival in the heart of Downtown Louisville. This year we will be celebrating for the second time and 2018 is looking like it will be even bigger and better. Surrounded by a beautiful venue with entertainment, food, beverages, and childrens’ activities in a family-friendly atmosphere the 2018 Big Four® Arts Festival will feature an all new line up of new Emerging artists and a curated selection of favorites from last year too. Parking is again going to be ample and easy to navigate with our dedicated trolley offering lot-to-gate service up and Down River road all day long.